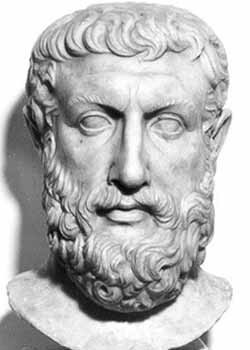 Parmenides of Elea (5th century BC) was an ancient Greek philosopher born in Elea, a Greek city on the southern coast of Italy. He is reported to have been a student of Xenophanes, and the founder of the Eleatic school, which also included Zeno of Elea and Melissus of Samos. He is one of the most significant of the pre-Socratic philosophers. His only known work, conventionally titled 'On Nature' is an apocalyptic poem, which has only survived in fragmentary form. Approximately 150 lines of the poem remain today. It is known, however, that the work originally divided into three parts: a proem, "the way of truth" (alethia) and "the way of appearance/opinion" (doxa). The proem is a narrative sequence in which the narrator travels "beyond the beaten paths of mortal men" to receive a revelation from an unnamed goddess on the nature of reality. Alethia, an estimated 90% of which has survived, and doxa, most of which no longer exists, are then presented as the spoken revelation of the goddess without any accompanying narrative. The traditional interpretation of Parmenides' extremely obscure and esoteric work is that he argued that the every-day perception of reality of the physical world (as described in doxa) is mistaken, and that the reality of the world is 'One Being' (as described in alethia): an unchanging, ungenerated, indestructible whole. Under 'way of seeming', Parmenides set out a contrasting but more conventional view of the world, thereby becoming an early exponent of the duality of appearance and reality. For him and his pupils the phenomena of movement and change are simply appearances of a static, eternal reality. Welcome, youth, who come attended by immortal charioteers and mares which bear you on your journey to our dwelling. For it is no evil fate that has set you to travel on this road, far from the beaten paths of men, but right and justice. It is meet that you learn all things - both the unshakable heart of well-rounded truth and the opinions of mortals in which there is not true belief. It is with respect to this religious/mytstical context that recent generations of scholars such as Alexander P. Mourelatos, Charles H. Kahn and the controversial Peter Kingsley have begun to call parts of the traditional, rational logical/philosophical interpretation of Parmenides into question. It has been claimed, for instance, that previous scholars placed too little emphasis on the apocalyptic context in which Parmenides frames his revelation. As a result, traditional interpretations have put Parmenidean philosophy into a more modern, metaphysical context to which it is not necessarily well suited, which has led to misunderstanding of the true meaning and intention of Parmenides' message. The obscurity and fragmentary state of the text, however, renders almost every claim that can be made about Parmenides extremely contentious, and the traditional interpretation has by no means been completely abandoned. Parmenides' considerable influence on the thinking of Plato is undeniable, and in this respect Parmenides has influenced the whole history of Western philosophy, and is often seen as its grandfather. Even Plato himself, in the Sophist, refers to the work of "our Father Parmenides" as something to be taken very seriously and treated with respect. In the Parmenides the Eleatic philosopher, which may well be Parmenides himself, and Socrates argue about dialectic. In the Theaetetus, Socrates says that Parmenides alone among the wise (Protagoras, Heraclitus, Empedocles, Epicharmus, and Homer) denied that everything is change and motion. For never shall this prevail, that things that are not are. Thinking and the thought that it is are the same; for you will not find thought apart from what is, in relation to which it is uttered. For thought and being are the same.It is necessary to speak and to think what is; for being is, but nothing is not. Helplessness guides the wandering thought in their breasts; they are carried along deaf and blind alike, dazed, beasts without judgment, convinced that to be and not to be are the same and not the same, and that the road of all things is a backward-turning one. Furthermore, he implied that it could not have "come into being" because "nothing comes from nothing." How could what is perish? How could it have come to be? For if it came into being, it is not; nor is it if ever it is going to be. Thus coming into being is extinguished, and destruction unknown. Nor was [it] once, nor will [it] be, since [it] is, now, all together, / One, continuous; for what coming-to-be of it will you seek? / In what way, whence, did [it] grow? Neither from what-is-not shall I allow / You to say or think; for it is not to be said or thought / That [it] is not. And what need could have impelled it to grow / Later or sooner, if it began from nothing? Thus [it] must either be completely or not at all. And it is all one to me / Where I am to begin; for I shall return there again.